Another weekend is fast approaching and with so many fun things to do you need to make your plans now to ensure you won&apos;t be missing out! With an abundance of live music and the first UGA football home game, there&apos;s no shortage of fun things to do in the Classic City! There is something for everyone so grab your friends, get out and explore all that Athens, Georgia has to offer! If you haven&apos;t heard of Corey Smith, you need to make your way over to the Classic Center on Friday night to see what all the fuss is about! His 2011 single, "Twenty-One", put him on the country music map and led him straight into the hearts of all Athenians. Growing up right outside of Athens, his love for UGA and the Classic City is at the forefront of his music and to see him live in the city where he grew up is really an experience you don&apos;t want to miss! The show starts at 8 p.m. and there are still some tickets left but don&apos;t wait too long because it&apos;s sure to be a sell-out! Find tickets and more information here! You can also head over to Lyndon House Arts Center this Friday night 7 - 10 p.m. to pair some tasty new beer with some inspiring short films! New Belgium Brewing, the maker of Fat Tire Amber Ale and many other award-winning brews, is bringing the Clips Beer and Film Tour to Athens once again and if you haven&apos;t experienced it before, you&apos;re not going to want to miss out on this! It is a national&nbsp;beer and film festival where guests can try beers from New Belgium&apos;s Lips of Faith series, along with some popular classics, and screen short films made by New Belgium fans. This year you can see films on mastering the technique of dice rolling, the quest for the ultimate full moon shot, a duel to be the hippest hipster, and home brewing in a small New York City apartment. Admission is free so if you&apos;re looking for something new to do with friends that doesn&apos;t break the bank, you can find more information on this exciting opportunity&nbsp;here! It&apos;s hereeee! It&apos;s finally here! Football has finally made its way to Athens, Georgia! For everyone who bleeds red and black, this is the greatest time of year. Saturday at 4:30 p.m., the Georgia Bulldogs will be teeing it up between the hedges against our hated rivals, the South Carolina Gamecocks! Last weekend against Clemson didn&apos;t fare too well for our dawgs, which makes this weekend against USC that much more important. It&apos;s been a few years since we last beat the Gamecocks and every dawg fan would love nothing more than to redeem ourselves. Don&apos;t miss this opportunity to be with all your closest friends and make sure to watch this heated match-up between SEC East rivals! Still unsure of your plans for UGA gamedays? Don&apos;t worry! 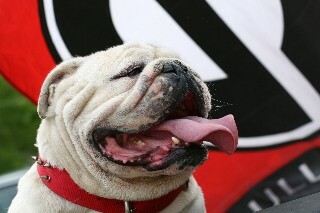 Check out visitathensga.com/football for all things UGA football. You can see what hotels are still available, information on parking, and many more fun ideas for how to maximize your UGA football experience! If any of these don&apos;t tickle your fancy, no worries! There&apos;s plenty more opportunities to have a good time in Athens, Georgia this weekend! Take a look at the event calendar&nbsp;for a complete look at events! Have a great weekend and GO DAWGS!